Love Your Lake 2018 is Underway! Welcome to our first blog post of Love Your Lake 2018! You’ll be able to visit our website each week to explore content ranging from the effects of cigarette butts on the environment, Love Your Lake updates, and guest blog posts from our friends at TerraCycle, In Balance Co. and Lake Ontario Waterkeeper. If you’re unfamiliar with our summer initiative, or feel like a recap wouldn’t go amiss, we’re here to remind you of the driving forces behind Love Your Lake. Love Your Lake is an hands-on project that involves 100 litter cleanups around the shores and parks of Lake Ontario. The concept is simple: our team of organizers and volunteers come together to collect as much waste as possible, and ensure that what is collected is then sorted to guarantee proper disposal. Thank you to the Whitby Blue Dot Group for joining us for a cleanup two years in a row! Fun fact! Did you know that a large portion of the refuse we collect does not end up in our landfills, but is rather repurposed or recycled? Even the cigarette butts collected are sent to TerraCycle, who then create industrial pallets and other items from the waste! Our first priority is, of course, cleaning up the shores of our beautiful Lake Ontario. Although its shores run more than 1,000 km through Canada and the United States, it remains one of the smallest of the Great Lakes. This makes it even more shocking that it is also said to be the most polluted of the Lakes, with more than 3 million pieces of refuse finding their way into the lake annually. 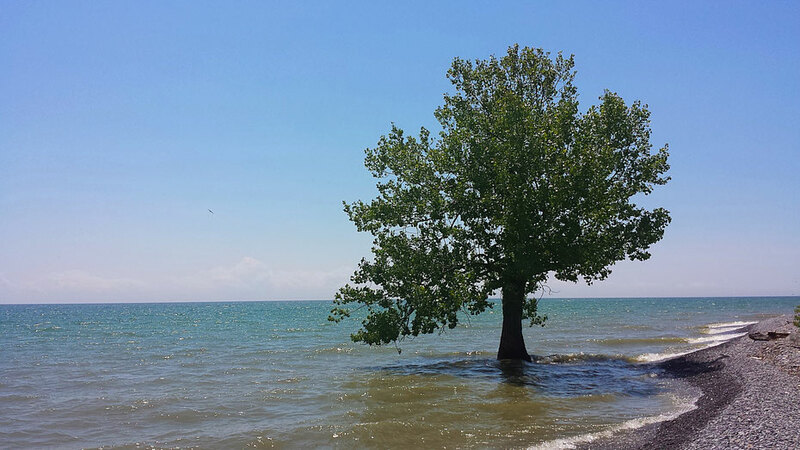 Lake Ontario needs our help, and we are here to deliver. It doesn't look polluted right? Most of the beaches we clean don't look too bad, but we always find lots to pick up! This photo was taken in Prince Edward County by Jessie Black during Love Your Lake 2017. Now, we can’t make that happen without the engagement of our community. Love Your Lake goes beyond litter pickup and disposal; we also strive to teach our volunteers about their impact on the environment, methods of reducing waste disposal, and aim to inspire changes in all of our daily lives. To date, with the building blocks of community engagement, education and inspiration, we have collected over 920,000 pieces of litter. This summer, we’re going to break 1 million. We can’t do it without our incredible volunteers, and are really looking forward to seeing both new and familiar faces. Together, we are the harbingers of change. Together, we can build A Greener Future. Older PostGuest Post - Don’t Be a Drag: Recycle Your Cigarette Butts!